The Lime Plastering Course offers 'hands on' experience in using both traditional and modern lime plasters and techniques. 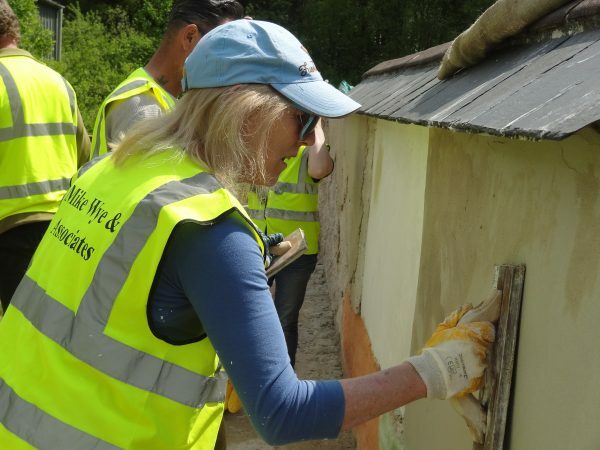 As the Lime Plastering Course is dedicated to plastering it offers far more depth than our Practical Use of Lime Course 1 which covers other tasks such as pointing. This will benefit those people wishing to better understand the processes and timings involved. Our approach is to create a relaxed environment where you will enjoy learning, with opportunity for discussion in the breaks. We limit course numbers to ensure you have individual tuition and guidance by one of our two course leaders. For each session there is a practical demonstration before hands-on plastering with guidance at hand. You will be provided with all tools, materials and personal protective equipment. Please bring suitable outdoor clothing and footwear. You will be able to purchase materials and tools for collection on the day. Participant will also be entitled to a 10% discount on all future purchases from our range of lime putty products and tools. For further details or to book a course please contact us. "Fantastic practical course with well informed professionals on hand to deal with every query and offer solutions to practical problems." Simon, 1st April 2016. "Really good hands on experience - a lot packed into a short time frame." Lesley, 1st April 2016.